Are your kids’ rooms bursting at the seams? Just as our waistlines feel the strain of a few too many holiday cookies, our homes (and especially the kids’ spaces) are likely to feel a bit overstuffed after the holiday gift season. While it’s important to remember to declutter before you organize, once you’ve paired back the old to make room for the new, getting a few smart systems in place will ensure that spaces look good long-term. Ahead are 10 simple but effective organizing tools, plus tips on how to use them. Trays with a lip around the edge (like the ones shown here) can be used to contain a Lego work in progress, a small puzzle or just about any little toy or game that comes with small parts. A tray also makes these activities portable, so your child can move from floor to couch to table as the mood strikes — and when he or she is done, cleanup is a snap. The slender spines of picture books make them nearly impossible to find when traditionally shelved. But prop them up on narrow shelves with the covers facing out, and they encourage browsing. Plus, the gorgeous cover artwork makes a built-in display. A rolling cart can be used for diapering supplies, dress-up accessories, craft materials, books or games. If there are toys or supplies you find yourself moving frequently, consider stocking them on a cart instead. And if you ever run out of purposes for this piece in the kids’ room, you can always use it as a bar cart, baking station or plant stand. For kids, out of sight really is out of mind. 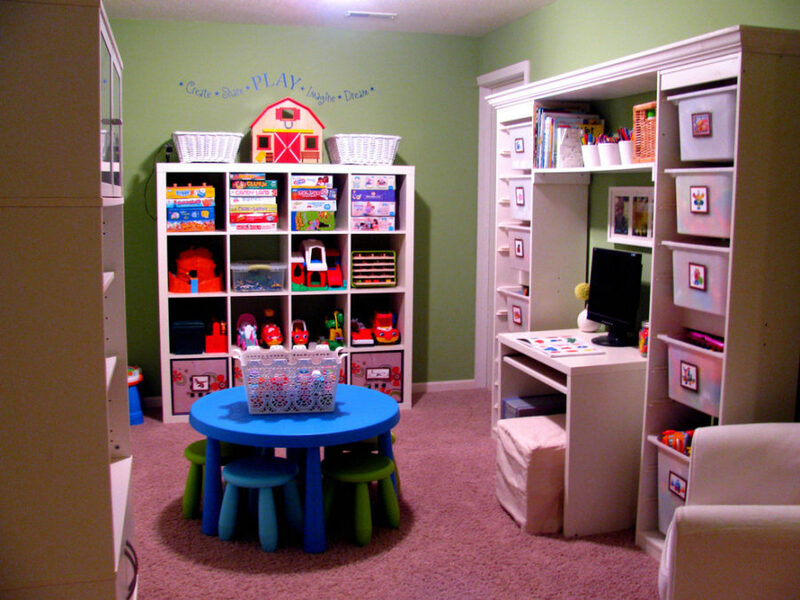 Include some open shelving in your child’s room or play space, and he or she will be more likely to use what is set out. One-piece toys (like stuffed or plastic animals) can sit right on the shelf; contain toys with loose parts in open baskets. When it comes to toys that you want your child to have access to anytime, open baskets are best. But when it comes to craft supplies and toys with tiny pieces that you would like to be able to store until they’re needed (or until they can be used with supervision), clear stackable boxes are the way to go. Add neat labels to make it easy to grab what you need at a glance. Whether it’s rocks, trucks, dolls or Lego people, most kids are collectors of something. But without a specific spot for storing and displaying these treasures, the “collection” is more likely to look like a jumbled mess. Narrow, wall-mounted shelves or cubbies provide just enough space to display small items one deep, which instantly lends order to these little finds. Instead of trying to cram shelves completely full so books won’t topple over (which then makes it extremely challenging to remove a book), invest in a pair or two of sturdy bookends. Lots of kid-friendly options are available to choose from, like the hefty leather animals shown here. Bonus: If you’re short on shelf space, you can use a set of bookends to create a mini library atop a dresser or desktop. A big bulletin board or magnet board makes a nice addition to a child’s room — and provides an easy home for loose papers that would otherwise be cluttering surfaces. Use it to display your child’s artwork, family photos, school papers and snippets of inspiration. I can’t think of a room that couldn’t use a wall hook or two, and kids’ rooms are no exception. Wall hooks (or pegs or knobs) are easy for kids to use and make a great cleanup helper for dress-up clothes, jackets, hats, jewelry and more. Big, general-purpose toy containers are generally frowned upon by professional organizers, and with good reason: Without a clear purpose, a giant toy box is just going to become a clutter magnet. But there are certain types of toys (I’m looking at you, stuffed-animal mountain) that refuse to be contained by anything but the most capacious container. Dedicate one generously sized soft basket for holding the stuffed animals, and cleanup can be as easy as scooping them all in.